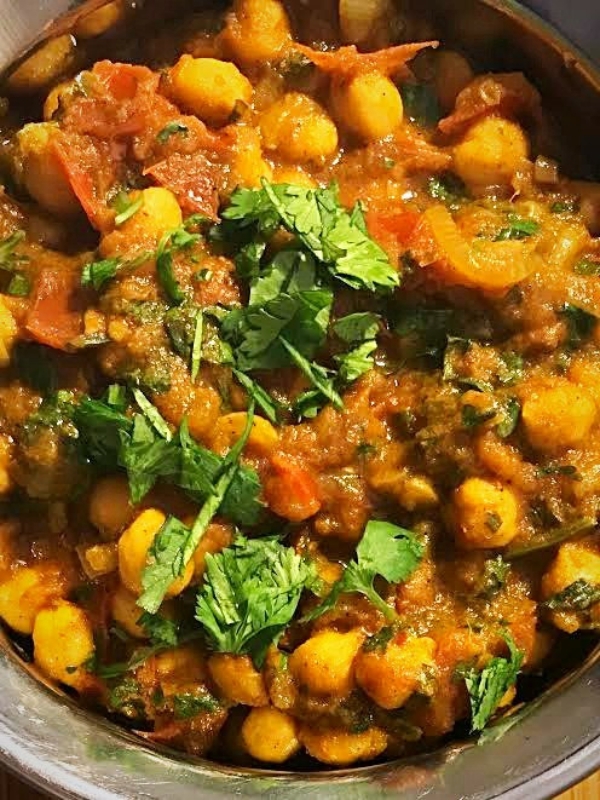 This dish of chickpeas in a spicy coating can also be found under the name Chole Masala.They are usually served with a puffy fried flat bread called a bhatura, but they also work very well just with a bowl of buttered boiled rice. Bring the vegetable oil to heat in a large saucepan. 1. Add the serrano chili and cook for 1 minute. 2.Add the dry spices, salt and sugar and combine well. If the spices begin to stick, add a tablespoon of water. 3. Add the chopped tomatoes. Cover the pan and cook for 5 minutes or until the tomatoes have broken down. 4. Add the vegetable stock and simmer 8-10 minutes until the sauce reduces to a thick consistency. 6. Simmer for 3-5 minutes. 7. Add the lemon juice and serve garnished with the remaining cilantro leaf.